The ratings are in, and it looks like “Sarah Palin’s Alaska” is a hit. TLC says nearly 5 million total viewers tuned in to the premiere of the series. In case you haven’t seen our previous coverage, “Sarah Palin’s Alaska” is a documentary series from producer Mark Burnett and starring former Alaska governor and Fox News Channel contributor Sarah Palin. Be sure to tune in Sunday at 9 p.m. EST for episode two. Sarah Palin’s documentary / travelogue / reality / biopic shattered TLC ratings records Sunday night. 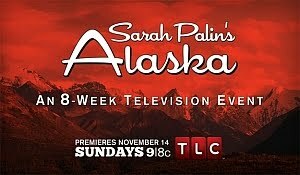 The debut of Sarah Palin’s Alaska delivered a whopping 5 million viewers. The first episode of the eight-part series was the most-watched program launch in TLC’s history. More details from TV Newser. I hope you all had a great weekend and had fun watching Sarah Palin’s Alaska last night on TLC. What a great show; I know I speak for many of you when I admit that I cannot wait until next week. Make sure to tune in next Sunday night at 6 pacific/9 eastern on TLC to catch the second episode of the eight-part series. Bristol Palin has “WOWED” America with her consistent improvement and her just-dance attitude during her time on Dancing with the Stars. Bristol needs our help again TONIGHT as she prepares to dance two dances in an all-out effort to make it into the finals. It is no secret that Bristol is the most-improved dancer left. It is also common knowledge that Bristol is the only contestant left who has no acting OR dancing experience. As the fabulous Kelly Osbourne recently said, “I love Bristol. I think she’s what the show is all about. She puts her heart into what she’s doing; there’s such vulnerability in her, and she gets up there every week by herself and does it.” Kelly is so right, Bristol IS what DWTS is all about. When I interviewed her for my blog, I found her to be so down-to-earth and genuine. There is not a diva bone in her entire body. In becoming a cast member on DWTS, she chose put herself out there, which illustrates her bravery and willingness to just let her hair down and have some fun. Sarah Palin recently tweeted some words of wisdom that Bristol shared with her when she first became a contestant: “No matter what I do, they’re going to criticize, so I might as well dance.” Well said, Bristol, well said. You just get out there and have some fun, and we will be there to support you and vote like crazy!!! Remember, it is up to all of you out there!!! YOU can help her get through to next week. Make sure you watch the show and VOTE, VOTE, VOTE!!! While it is vital that you call 1-800-868-3407 with as many phones as you have, voting multiple times, it is just as vital that you vote online at <a href=”http://www.abc.com”>abc.com </a>and if <span style=”font-style:italic;”>AT&T </span>is your cellular carrier, text your votes to 3407. 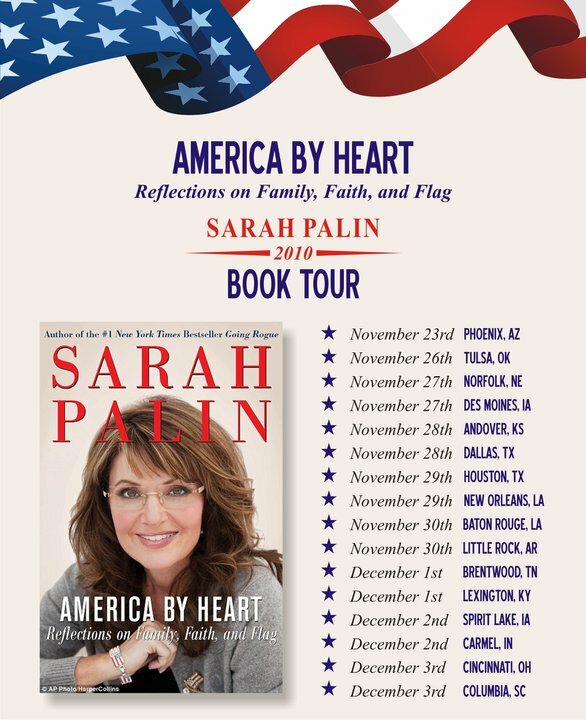 “Sarah Palin’s Alaska was the topic of discussion on a segment of Good Morning America this morning (h/tp SPAlaska). AlthoughGovernor Palin’s Presidential ambitions are unclear yet, there was one thing everyone could agree on – the beauty of Alaska. Most Presidential hopefuls start the publicity machine for their candidacy with a book blitz–Mitt Romney, who is widely expected to make another run for the presidency in 2012, hit key primary states during a recent book tour, which looked quite a bit like a presidential campaign schedule. Obama did it in 2006, proving the hype over a book can be disguised as a potential campaign run. As part of the public relations roll-out, Obama’s team made a deal for Time Magazine to run excerpts, he was on the cover with the headline “The Next President,” and he appeared on the show of book-selling guru herself, Oprah. Consider it a clever strategy to gin up some publicity, keep your name in front of the people, and tip those favorability polls in one’s favor, but as we’ve found out, Sarah Palin does things differently–Yeah, she has a book tour scheduled for her latest book, “America By Heart”, but unlike others, she has also decided to scale Mt. McKinley and come face to face with a mama grizzly in her new TLC series, Sarah Palin’s Alaska. “The biggest challenge for me is to be intense and fierce in the Paso Doble and graceful and elegant in the Waltz,” Bristol says. But Bristol believes it’s her hard work that is keeping her alive. After eight weeks of taking the stage, Bristol says it’s finally hit her that the mirror ball trophy is in her grasp. “This is the first week where I realize that there’s only a few days left in this whole competition and it’s realistic to think that it’s in reach,” she says. She and Mark also credit the fact that they’ve tried to stay out of the spotlight as much as possible. “I don’t think that many people are sick of us yet,” Bristol says. And we live to see another week! Am I surprised that we keep making it through despite scores at or near the bottom each week? Absolutely not. This show is driven by the fans’ voting, and Team Ballin has great fans. Bristol did great this week and I was proud of her. She deserved higher than the judges gave her in the Argentine Tango, and Carrie Ann’s 7 in the Samba was wack. She definitely deserved higher.I was irritated because I made a mistake in our Samba. What’s fun about making mistakes in front of 20 million households? Nothing. We got turned around in our routine so we ended up being on the wrong side of the floor. The room we practiced in was tiny compared to the ballroom, and we only had 20 minutes. Oh well. We did our best and that’s all we are focused on. This week we have two dances again: the Paso Doble and Waltz. She’ll do really well in Paso because her demeanor, which is very straight-faced, matches the expression and motivation of the dance. And we just performed the Viennese Waltz a few weeks back, so I expect Bristol to really challenge for the finals. This week (Monday night) we have the Waltz and Paso Doble. By Friday, we already had the basic routine of the Paso down, so we have to learn and perfect the Waltz over the weekend. These two dances are very different. The Paso is the bullfighter’s dance, aggressive and arrogant. The Waltz is slow and smooth, like you’re dancing on a cloud. Both are dances that Bristol has the ability to do well in, and we’re doing everything we can to make the finals. Speaking of the finals, we’re only one week away from it! It’s incredible how far Bristol has come in the three months that I’ve been teaching her.. When we met, she had absolutely no dance background and now she’s blossomed into a beautiful dancer, capable of pulling off many disciplines of dance. To think she did all of this with zero performance experience is remarkable! Bristol’s had a tough road and she’s handled it better than anyone could imagine. I really think that any of the four of us semi-finalists can get eliminated this week. Yes, Bristol and I are at the bottom in the judges’ scores, but we continue to get votes from the fans. Remember, all of the four remaining celebs have dances that are strengths and weaknesses, so you really never know how Monday night will fair. Did you catch us on Larry King Live on CNN? I loved meeting Larry, and it was a pleasure to do his show. He’s an icon in the entertainment business, and doing these shows really are a perk that I enjoy about my career. Last week Ellen (DeGeneres), this week Larry. Who’s next week, Oprah? I need to get somebody on that! It’s a long and expensive flight from Alaska to Los Angeles, but Bristol Palin has had a steady cheering section in the ballroom for Dancing With the Stars. How? Her parents, Sarah and Todd Palin, have been treating family and friends to plane tickets. Sarah, Todd, their daughters Piper and Willow and even Bristol’s grandmother, Sally Heath, have all made the trip to be the ballroom to watch Bristol perform the cha cha, the Viennese waltz, the quickstep and the Argentine tango. Family attorney and friend Tom Van Flein and his daughters also got to go and watch. and a video with a montage of Bristol and Mark’s dances through Week 7. Bristol also reached 12,000 followers on her Facebook page on Friday. (A big hat tip to DanceBristol Dance for this information and the links to all the articles and videos above.) DanceBristol Dance is definitely the place to go for up-to-date information about Bristol Palin! We at SPIB are looking forward to what we know will be a stellar performance by Bristol and Mark on Dancing with the Stars. Be sure to tune in at 8 PM EST to ABC and vote, vote, vote for Bristol and Mark! As a reminder, you can vote by phone by calling 1-800-868-3407 or by texting 3407 (AT&T customers only). You can vote online by logging in at the Dancing With the Stars Voting Page. Voting by phone is open from the start of the show in your time zone until 30 minutes after the show ends. Online voting is open from 8 PM EST on Monday night until 11 AM EST Tuesday morning. That means that online voting starts and ends 4 hours earlier in Alaska than on the East Coast, 3 hours earlier on the Pacific Coast, 2 hours earlier Mountain Time, and 1 hour earlier Central Time. As you know, our votes are factored in with the judges’ scores. We know Bristol and Mark’s performance will be outstanding, so let’s do our part to help them win! Below are dates, times, and locations for the tour. Please feel free to contact each venue for more information. My family will be joining me along the way, and they look forward to meeting you as much as I do. We’ll try to add some more stops if time allows. And, of course, we’ll wrap up the whole tour in Alaska just as we did last time. P.S. Included below is a flyer for the tour. Feel free to pass it around! Asked what’s behind the Palin appeal, producers of both “Sarah Palin’s Alaska” and “Dancing with the Stars” say Americans can relate to these women. As for Bristol, “Dancing with the Stars”’ executive producer Conrad Green says everyone had heard of her, but no one really knew her. She also shows up from time to time on “Sarah Palin’s Alaska,” which shows audiences the Palin family home and many breathtaking landscapes. “It was something Sarah really wanted to,” says Daniels. “She really wanted the chance to show off her state,” which “Alaska” definitely does, from a flyover of Denali National Park to a close encounter with a family of bears while salmon fishing. In the show, Palin certainly talks about her work and makes nods to political issues of the day, but “Sarah Palin’s Alaska” is expressly not political. Viewers also see her at home, with her large family. It’s all tailor-made to portray Palin as a family-focused woman who would rather be hiking, camping and fishing than touring the US and talking to tea-partiers. It also shows that Palin has a sense of humor and a thick skin.